Is Ecstasy Addictive? How Addictive is Ecstasy? Am I Addicted to Ecstasy? Despite horror stories about Ecstasy-related deaths, the drug continues to be a popular one, particularly among young people. More than 7% of high school seniors have used Ecstasy at least once, and a single use of Ecstasy may be all it takes for the drug to claim your life. Ecstasy is a synthetic designer drug popularly used in social or group settings, such as at clubs or raves. For this reason, some users mistakenly believe that it's not addictive, or that it's less addictive than other drugs. Ecstasy, though, is powerfully addictive, with some reports pointing to as many as 40% of users eventually developing an addiction. It's Not Too Late to Get Help If you recognize these signs in yourself or someone you care about, don't wait to get help. Find treatment now. Endangering yourself while under Ecstasy's influence, or placing yourself in risky situations to obtain Ecstasy. Not being able to remember things you did while under the influence of Ecstasy. Experiencing strong drug cravings, or physical withdrawal when you attempt to quit using. Structuring your day around your use of Ecstasy. Lying to loved ones about your use of Ecstasy. If you observe these signs in yourself or a loved one, don't panic; addiction can become more debilitating with denial, but acceptance is a very clear sign that you want to redeem yourself or your loved one from this addiction. It doesn't matter whether you're addicted to Ecstasy or just a recreational user; any use of Ecstasy can claim your life. When you become an addict, though, you greatly underestimate the perils of Ecstasy use, and may also deny the effect the drug has on your life. The truth is that if you think you might be an addict, it's a sure sign you have a problem and need help. Sadly, you can't make another person accept treatment, no matter how hard you try. What you can do is create an environment where using Ecstasy is more challenging than not using. Not giving money to an addict. Not doing anything to accommodate their addiction. Offer them love and support. When your loved one is finally ready to seek treatment, be there to help them choose the right treatment option and navigate the recovery journey. If you've run out of options for helping your loved one, then an intervention may be in order. This approach uses strong peer pressure and lots of love to get your loved one to see the error of his or her ways. It's important to only invite people who genuinely care about your loved one, who understand the disease of addiction, and who are committed to your loved one's lasting sobriety. Sharing the ways in which the addiction has affected the addict's loved ones. Sharing how each member of the group will react if the addict is unwilling to seek treatment. Encouraging the addict to seek treatment, often at a treatment facility that has been preselected by the group. You don't have to suffer with the pain of a loved one's addiction alone. Addiction can completely overtake an addict's personality, turning him or her into a shadow of the person they used to be. Help you regain control over your life. Learn about the disease of addiction. Set clear boundaries to prevent your loved one's addiction from continuing to hurt you. Nar-Anon, a spin-off of the 12-step program Narcotics Anonymous, is free, with meetings occurring throughout the day. 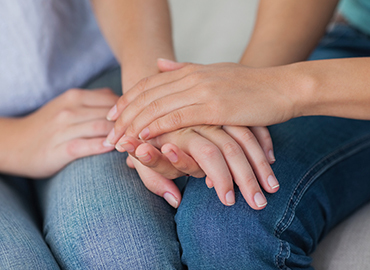 Some local groups, such as churches and rehab facilities, may also offer support groups, so check listings in your area. Just as an addict cannot choose addiction, he or she cannot choose to get well. Addiction makes recovery without assistance virtually impossible. Luckily, a multitude of options for recovery and rehab are available for those seeking treatment. Inpatient rehab offers a safe and supportive recovery environment, not to mention a host of services to help you get well--including therapy, 12-step groups, medical support, and even enrichment activities to take your mind off of drug cravings. If you want rehab to feel like a vacation, consider a luxury facility, which offers addiction treatment in a relaxing, resort-like setting. For busy professionals, executive rehab can be an excellent option. Not only will you have plenty of privacy; you'll also have access to meeting areas, a business center, and other career resources. Worried you don't have time for rehab? Consider partial hospitalization or intensive outpatient, which is a sort of middle ground between inpatient care and outpatient support. With these programs, you attend intensive sessions during the day, and are then able go home at night. If the options above sound like too much of a time commitment, your outpatient treatment options include regularly scheduled therapy, 12-step programs, and medical care, each of which can help you get clean if you're willing to put in the necessary time and effort. Remember, different wants and needs require different treatment. Make sure to pick the type that's right for you. You deserve the best possible treatment, even if finding it requires a little extra effort. Your risk of relapse is lowest when you feel supported and understood; so don't end your search until you find a facility that feels like your home away from home. Ask other recovering addicts about their experiences. A journey begins with a single step, and the walk to sobriety begins with accepting that you have a problem. You can do this, but you can't do it without treatment. Begin your journey or help your loved on start theirs by calling 1-888-993-3112Who Answers? to confidentially discuss treatment today.